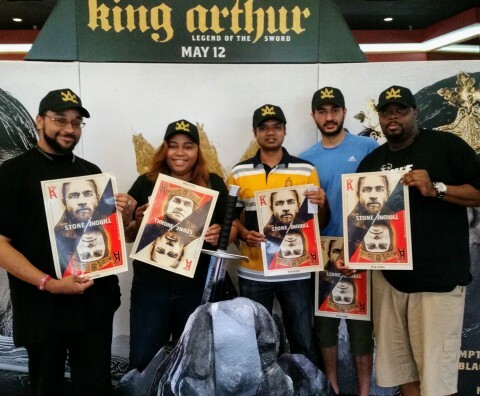 BURBANK, Calif.--(BUSINESS WIRE)--Moviegoers around the U.S. were given “King for a Day” status last evening at 200 sold-out AMC Theatres—50 more than the original 150 participating, due to overwhelming demand—for a free advance screening of Warner Bros. Pictures’ and Village Roadshow Pictures’ “King Arthur: Legend of the Sword.” An estimated 30,000 lucky attendees were not only treated to the fantasy action adventure more than two weeks before its theatrical release, but also received a limited edition, movie-themed hat and a special poster created by Shepard Fairey’s Studio Number One team. 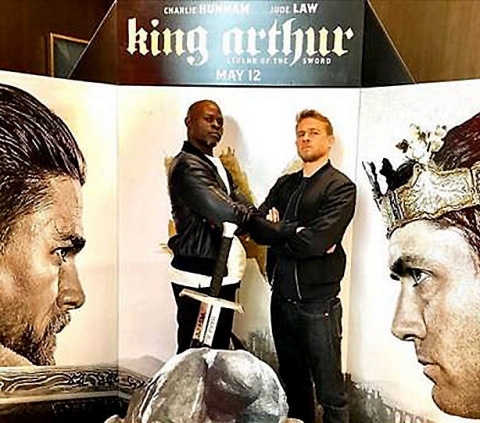 Just days before the April 27 screenings, King Arthur himself, Charlie Hunnam, and his co-star Jude Law, posted online videos touting the event, and yesterday, hours ahead of the 7 p.m. screening start time, Hunnam, along with co-star Djimon Hounsou and the film’s director, Guy Ritchie, participated in live Q&As on Facebook, Twitter and Instagram. Nationwide, the one-day screenings were met with great enthusiasm at the theatres—many fans even arrived in costume for the occasion. 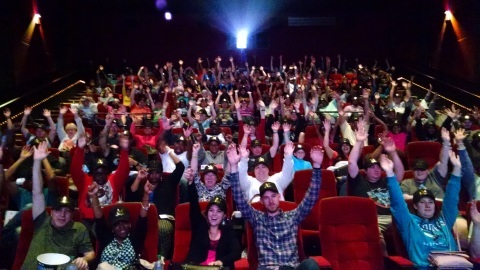 The screenings were followed immediately by an onslaught of social media sharing in which those “crowned” King for a Day posted photos in their “King Arthur” caps. Advance ticket sales for the upcoming May 12 wide release begin today at AMCtheatres.com, Fandango and wherever movie tickets are sold. All around the globe, excitement for the movie builds as the King Arthur 360 Sword in the Stone installation draws crowds in New York, Toronto, Paris, Sao Paulo, Chicago and, shortly, Los Angeles, where the exhibit will be a fun feature for fans gathered outside the film’s red carpet World Premiere on Monday, May 8, at the TCL Chinese Theatre in the heart of Hollywood, California. Acclaimed filmmaker Guy Ritchie brings his dynamic style to the epic fantasy action adventure “King Arthur: Legend of the Sword,” from Warner Bros. Pictures and Village Roadshow Pictures. Starring Charlie Hunnam in the title role, the film is an iconoclastic take on the classic Excalibur myth, tracing Arthur’s journey from the streets to the throne. Starring with Hunnam (FX’s “Sons of Anarchy”) and Oscar nominee Law (“Cold Mountain,” “The Talented Mr. Ripley”) are Astrid Bergès-Frisbey (“Pirates of the Caribbean: On Stranger Tides”) as Mage; Oscar nominee Djimon Hounsou (“Blood Diamond,” “In America”) as Bedivere; Aidan Gillen (HBO’s “Game of Thrones”) as Goose-Fat Bill; and Eric Bana (“Star Trek”) as Arthur’s father, King Uther Pendragon. Warner Bros. Pictures presents, in association with Village Roadshow Pictures, a Weed Road/Safehouse Pictures Production, a Ritchie/Wigram Production, a Guy Ritchie film, “King Arthur: Legend of the Sword.” Slated for release on May 12, 2017, the film will be distributed in North America by Warner Bros. Pictures, a Warner Bros. Entertainment Company, and in select territories by Village Roadshow Pictures. The film has been rated PG-13 by the MPAA for sequences of violence and action, some suggestive content and brief strong language. 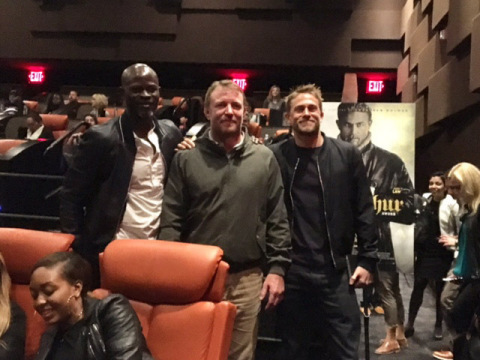 Warner Bros. Pictures and AMC Theatres Crowned Fans Across the U.S. “King for a Day” - Audiences flocked to theaters to be the first to see Guy Ritchie’s “King Arthur: Legend of the Sword"